With the increased plantings of vineyards throughout New Zealand the problem of grape damage by birds has become a huge problem. Establishing new vineyards usually involves cutting down the trees that are already there to reduce this problem in the future. However, the question is now being asked about whether planting New Zealand native trees in vineyards would, like exotic trees, increase the populations of potential grape-damaging birds, such as starlings and silvereyes. Over recent years, Dr Valerie Saxton, from the Viticulture and Oenology Centre in the Faculty of Agriculture and Life Sciences at Lincoln University has overseen two surveys comparing vineyards and native trees for diversity of bird populations. “We theorised that planting native trees in vineyards would not increase bird pressure but, in fact, may improve the situation by increasing the numbers of different species of birds and, through natural competition, reduce the population of pest birds,” said Dr Saxton. The two surveys were conducted in native tree remnants in New Zealand grape growing regions. One was in Marlborough and the other in Waipara. There were nine sites in Marlborough but no vineyard sites. In Waipara there were two native tree sites and two corresponding vineyard sites. Both surveys used the Department of Conservation’s five minute bird count survey method with counts being taken three times each day at each site for a total of 10 days (Marlborough) and six days (Waipara). Birds were noted as heard and/or sighted. 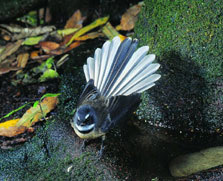 The different species identified were then classified into four categories: native birds excluding silvereyes, non grape-eating exotic species, silvereyes and other grape-eating species. “The two surveys both showed there was a much greater biodiversity of non-grape eating predominantly exotic birds, but also some native birds, in the native trees than in nearby vineyards. There was also considerably less avian biodiversity in vineyards and the majority of the birds there were grape-eating pest birds,” said Dr Saxton. “What was very interesting was that neither survey found grape-damaging starlings in native trees. Starlings can be particularly devastating because they fly in flocks and each so much per bird. Overall, these surveys showed that native trees host only minimal populations of grape-damaging bird species but do host a very large diversity of other avian species but not starlings. Dr Saxton presented her work at the 2008 Bragato Conference in Christchurch, where it generated considerable interest from the other participants.